With its latest innovation, HP is giving you the chance to work on its next-gen computer – the Sprout. All you need to do is think up future apps for the Sprout, and you could be in with a chance of winning trips to California or HP computers! Are you a student or young graduate? Then come and take part in HP's major revolution! With its new take on the PC, HP's aim is to transform how you work, create, design, and more! The Sprout is a new immersive take on computing that will astound you with its range of features, including a graphics tablet, projector and 3D scanner – the perfect inspiration for creating a whole host of new Sprout apps! Build a team of 2 or 3 people with complementary skills and dream up your future Sprout app! Use the Sprout's features (including a graphic tablet, 3D scanner, projector and touch screen) to imagine new apps for this immersive computer and rethink the way you work and learn. Present your idea in 3-5 slides and submit it via your team space. The best ideas will be developed into real apps. If you don't know how to develop apps, then no worries – our coaches will be there to help you with your project. Let your imagination run wild – the possibilities are endless, including apps for education, for professionals, cultural apps, artistic apps, and more. The best ideas will be developed into real apps – and who knows, maybe they'll be some of the best on the Sprout Marketplace! Each team member in the first-place team will win a trip to California, in the heart of the Sillicon Valley, birthplace of HP (worth €1,824) or the equivalent in gift certificates. Each team memberof the second team will win a laptop HP Elite x2 1012 (worth €1,438.80). Each team memberof the second team will win a laptop HP x2 210 (worth 396€). - Docscan : Scan books, documents and hand-written notes. Annotate and highlight your documents and scan and share them with ease. - Size Up : Measure objects instantly. - Anatomy 4D : Journey inside the human body and discover every detail in 3D. - External Display Mixer : Project your display for more interaction. - Origami Apprentice : Learn origami with the Sprout – just follow the instructions projected onto the mat and the visual and spoken instructions on the upper screen. AEF is a digital information group operating in the fields of education, research and innovation, working on issues linked to employment and professional integration. Every year, it organizes a flagship event, the Higher Education and Research Show, taking place this year on 16 and 17 March in Paris. It's a venue where attendees can network, meet the people who create innovations, and get sneak peeks of the technology and services of the future. 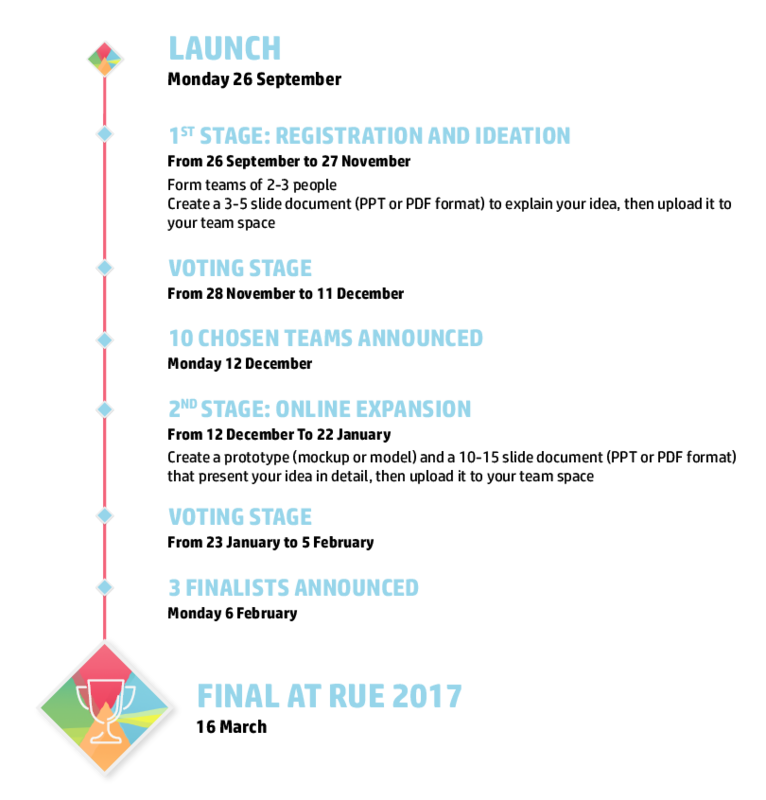 The finalists' pitches and the awards ceremony will take place at RUE 2017, the Higher Education and Research Show at Palais des Congrès.